On paper, eighth-seeded Oregon’s first-round NCAA Tournament matchup with ninth-seeded Oklahoma State appears to be a one-sided affair favoring the Ducks. Per ESPN.com, the Cowboys are 178th in the nation in points per game, and 145th in field goal percentage. Oregon, meanwhile, checks in at 26th in the country in scoring, and a respectable 63rd in field goal percentage, shooting just over 46 percent per contest. Defensively, Oklahoma State is downright anemic rebounding the basketball, coming in at 262nd nationally. This is far worse than our beloved Ducks, who, for all of their perceived weaknesses on the glass (many of which are justified), check in at 72nd in rebounds per game. 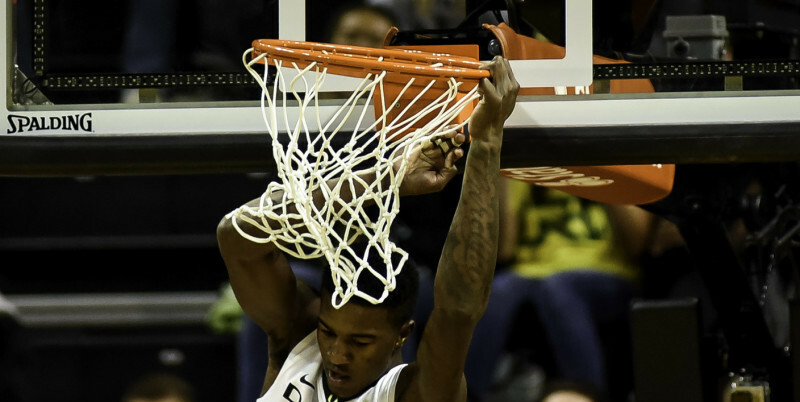 Oregon enters the NCAA Tournament riding high, but drew a tough first-round opponent. In the win-loss column, the Cowboys are a mere 18-13, with an 8-10 record in Big-12 play. Oregon is 25-9 overall, with a 13-5 conference mark. Why, then, should any Duck fan be concerned about Friday’s matchup? First, Oklahoma State is better than its record. It plays in a conference currently boasting five ranked teams, and seven NCAA Tournament teams. The Pac-12, meanwhile, has two ranked teams and four tournament squads. The upshot? Oregon played six ranked teams in 2014-15. The Cowboys played fourteen. That four-loss difference between the two squads becomes a lot more justifiable when factoring in that statistic. Oklahoma State also beat Kansas, and boasts two wins against Baylor. Two of those wins—at home versus Kansas and on the road against Baylor—are easily better than any win Oregon has this season. Strength of schedule aside, if you are looking for a barometer for postseason success in college basketball, teams entering the tournament on a hot streak tend to advance. The Ducks enter the field red-hot, winners of eleven of their last thirteen. Oklahoma State, meanwhile, enters the Big Dance losing six of its last seven outings. Advantage Oregon, right? In the words of Lee Corso: not so fast, my friend. Of those seven games, the Cowboys played four ranked teams. They were tied at halftime against Big-12 tournament champion Iowa State before losing by five, and tied at half against West Virginia before fading in the second stanza. Oregon will need to bring its A-game against a battle-tested Cowboys squad. The Cowboys then suffered a one-point loss on the road at Texas Tech (losing on a game winning shot, mind you), before avenging an earlier loss to TCU. In their final two games of the year, they hung with West Virginia again before falling by nine, and were up at halftime against Oklahoma before admittedly getting torched in the final twenty minutes. This is not reflective of a team playing poor basketball. They simply played better teams, played reasonably well (save for the second half against Oklahoma), and got beat. Oregon is a good team, but would certainly be an underdog on a neutral court against Iowa State, West Virginia, or Oklahoma. Thus, the Cowboy’s record over the final stretch of the season is not indicative of the challenge they will present for the Ducks this Friday. Finally, Oklahoma State is fairly good defensively, giving up an average of 62.3 points per game. They also rank 22nd nationally in blocks per game, and 26th in steals. Oregon, meanwhile, gives up an average of 70.7 points. If the Cowboys can slow the game down and limit Oregon’s possessions and shot attempts, they could easily advance to meet what will almost certainly be one-seeded Wisconsin in the round of thirty-two. The key for the Ducks will be to limit turnovers and negative plays against an opponent very adept at forcing them. If Oregon can keep the game wide open and fast-paced, Oklahoma State, being more of a defensive-oriented, ball-control team, will find itself out of its comfort zone. In contrast, the Ducks will be right in their own wheelhouse. However, Oklahoma State has two big-time scorers that can keep them in any contest: senior LeBryan Nash and junior Phil Forte, who average seventeen and fifteen points per game, respectively. Oregon must limit one of these all-conference players if it wants to advance. Harassing the Oklahoma State shooters must be a priority for the Ducks. The choice here is easy: Forte, the long-range specialist. Given the Ducks’ up-tempo style, he is far more of a threat than Nash, a powerful combo forward who excels at getting in the paint. 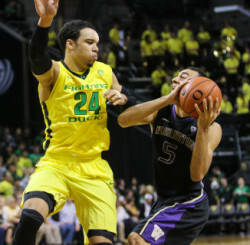 If Oregon loses Forte in its trapping full-court defense, and he is able to knock down at least four transition threes, the Cowboys will keep the game close, even if it is played at the Ducks’ pace. Per Oklahoma State’s website, Forte averages 17.6 points in wins, and 11.6 in losses. Transition three-pointers are huge momentum swings, especially for a team like the Cowboys that struggles to find points. Oregon cannot bail Oklahoma State out with easy scoring opportunities, and therefore must limit transition three-point looks by keeping Forte in check. The Ducks can throw multiple athletic forwards at Nash in Elgin Cook, Dwayne Benjamin, and Dillon Brooks. While none is the player Nash is, in combination they can do enough to keep Nash from having a crazy-efficient offensive night. If the Ducks play Nash one-on-one and limit Forte and the Cowboy’s three-point field goals, they will find themselves battling the Badgers on Sunday. If not, things could get interesting, and it will come down to who can make plays in the last few minutes. Make sure to tune in Friday to find out.